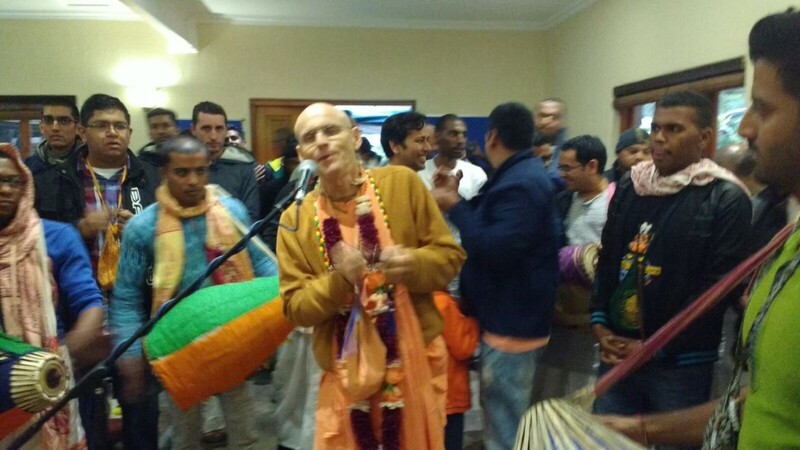 Kadamba Kanana Swami spent the week after Radhastami in Durban and then decided to fly to Johannesburg for a short visit so we left Durban on Saturday morning (17 September). 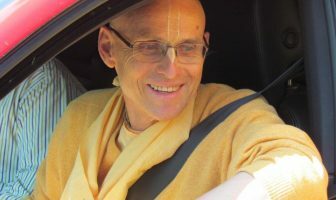 Upon arrival in Johannesburg, we were fetched by Maharaj’s disciple Hrdaya Caitanya and first we spent a few hours at the home of Sri Govinda and Jayalalita before setting off to Midrand, about midway between Johannesburg and Pretoria, to the home of Girivaradhari Prabhu. The kirtan was especially sweet that evening and Maharaj enjoyed it a lot. Vibhu Caitanya’s mother, Aditi dd was there to prepare dinner for Maharaj and many other devotees had also come to the program which was so spontaneously arranged! The next morning, Maharaj took some time to meet disciples who wanted to speak to him. It had cooled down quite a bit over the weekend so when we walked around the protected area where we stayed, we equipped ourselves with umbrellas, rain jackets and several sweaters. The Sunday Love Feast program at the Midrand temple started at 4pm. We arrived in time and Maharaj got ready to lead the kirtan after he had greeted some old friends. In his lecture, Maharaj spoke about Krsna’s neutrality. He made the point that Krsna, because he is not interfering with our free will, lets us engage in whatever activities we want to. Krsna never wanted this material world to exist but created it because of our desire to be the controller. Maharaj elaborated on the point of neutrality; he gave the example of Narada Muni, who as a child went to the forest to meditate and eventually got darshan of the Lord but when the Lord disappeared, he got angry. Krsna then returned and told Narada that he would not see him again in this lifetime. So again Krsna took his neutral position and maintained it even though Narada was a great devotee. Maharaj explained that Krsna does this to test us – he wants us to come to the point of eagerness, eagerness to see him and to be with him! At the same time though, his neutrality, in a way is also a facade. It is said that Krsna is more eager for us to return to Godhead than we are. He sees that we are suffering and wants us to return to the spiritual world. After the class which for me was really eye-opening, Maharaj led Guru Puja as well. 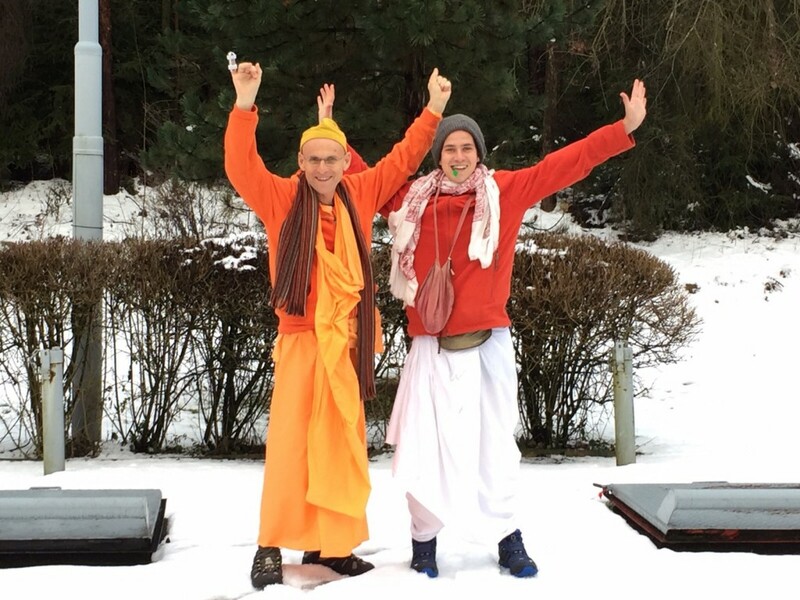 As he started to sing, one devotee picked up an accordion and started playing along and it turned into a wild kirtan in no time, with Maharaj dancing ecstatically in the middle of all the other devotees! On that high note, the program ended and early the next morning, we flew back to Durban. Over the next week, Maharaj had a very relaxed schedule with only a few engagements. 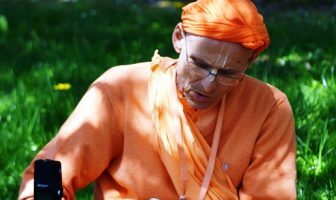 On Tuesday night, the weekly book club gathered to talk about Caitanya Caritamrta, Chapter 8 and when asked, Maharaj was more than happy to facilitate the discussion. First, he gave us an overview of the CC before explaining the 8th chapter in detail. Thereafter, Maharaj had another two full days of rest; he would sometimes work on his novel or speak to whoever would visit his room. However, we never failed to do our walk on the beach! Agnidev Prabhu had come to stay in Durban for a week and was doing a lot of evening programs. 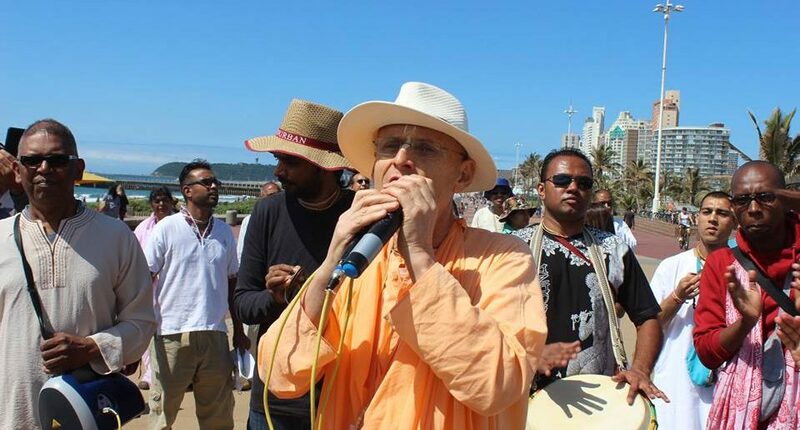 He had come to the Durban Ratha Yatra last year and said that he likes South Africa a lot and the devotees appreciate him a lot too. When he found out that we were going for walks on the beach, he decided to join us for his remaining days in Durban. He would go for a swim in the sea every day and I was fortunate enough to go with him one day! On Friday night, Maharaj did another house program. It was a wonderful little program with a lovely atmosphere. Maharaj started giving turns to all the devotees to lead kirtan and thus involved everyone more actively. Earlier that day, I had heard Maharaj practice that night’s tune in his room and he said that he sang it for the first time. On Saturday (25 September), it was Heritage Day in South Africa and a public holiday. Since Maharaj wasn’t scheduled for any program that day, he decided to organise a “Maha Harinama” and so he did. We went to Durban North Beach at around noontime and started walking up and down the beachfront with about 40 devotees. Maharaj led kirtan and rocked it for almost two hours. 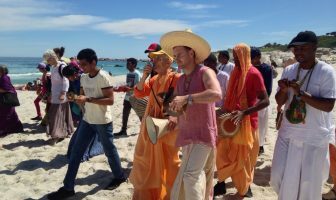 The kirtan was already quite ecstatic but when Maharaj led the party onto the beach, people came out of the water to join us. They formed a circle around the devotees and all started dancing. Maharaj let them sing too, reading the maha mantra from one of the flyers we were giving out. The harinama continued until late but Maharaj went back to the temple and was completely exhausted for the rest of the day. He was also saving energy for the next day’s program where he was participating in a six hour kirtan at the New Jagannatha Puri temple in Phoenix. Early on Sunday morning (25 September), I made my way to the airport to travel back to Germany. My year of serving and travelling with Maharaj had come to an end and I had to say goodbye to him and all the devotees until we meet again. Even though I was naturally sad to leave, I focus on the positive. I am eternally grateful for the opportunity that I got! It was wonderful travelling with Maharaj and I feel like I have learned much, much more than I could have anywhere else. I have great respect for Maharaj, for all the service that he is doing and the fact that he never stops. When he speaks about the eagerness for serving Krsna that we should develop, I can see so much of that in him. Thank you to all the devotees that I’ve met throughout the time I have been with Maharaj for always taking such wonderful care of me; I won’t forget you either!